…at Ara Ambigua, we enjoyed an open air breakfast watching birds from our table. After breakfast and a short walk we returned to our room for a nap, attempting to get into the rhythm of Costa Rica. I woke abruptly when a housekeeper came into the room. I was laying atop the bed in nothing but my Exofficio Give-n-Go™ Briefs! Nice. After I recovered from the embarrassment we drove to Lapa Verde refugio, (5 clicks from Ara Ambigua at Chilamate) met Oscar Lopez. Lapa Verde is a 650 hectare private reserve. A very important project to increase the corridor needed for the endangered Green Macaw. 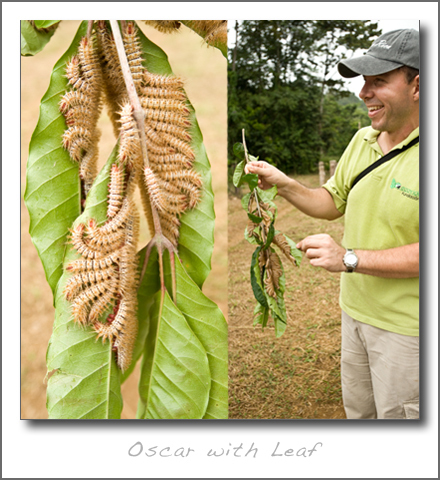 We chatted and I took the above photo of Oscar holding a leaf filled with moth caterpillars. We returned to the lagos where the Egrets and Little Blue Herons were coming to roost. This heron on a palm made a rather interesting subject so I made several images as howler monkeys told me of their displeasure of our presence. Then as the light was fading, we returned to the lodge for dinner.